On Sunday, 26 March, ‘The Legacy of Olja Ivanjicki’ exhibition was opened at the Historical Museum of Serbia. After introductory words by Dr. Dušica Bojić, Director of the Historical Museum of Serbia, Tijana Jovanović Češka, the author of the exhibition, and Suzana Spasić, Director of the ‘Olga Olja Ivanjicki’ Fund, the exhibition was opened by Mrs. Maja Gojković, President of the National Assembly of the Republic of Serbia. 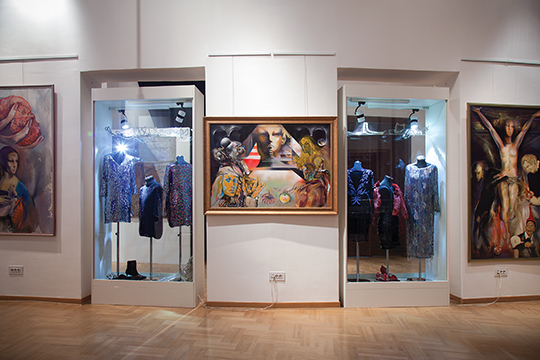 The exhibition was supported by the Ministry of Culture and Information of the Republic of Serbia, and by Division Visual Solutions, DDOR Novi Sad and the ‘Mona’ Fashion Company. Through the legacy of this famous artist, on display for the first time in its entirety, the exhibition is intended to remind the public about the still unsolved issue of the permanent storage and presentation of Olja Ivanjicki’s legacy, which was temporarily allocated to the Historical Museum of Serbia after her death in 2009. The most comprehensive cross-section of her opus so far, the exhibition presents her diverse artistic creativity in the fields of painting, sculpture, fashion design, architecture and poetry. The exhibition includes almost 200 paintings, sculptures and drawings from all periods of her work, as well as personal belongings (photos, sound recordings, furniture, a collection of glasses and candlesticks, etc. ), which were not only part of her everyday life, but also an inexhaustible source of inspiration for her. To bring the ambience of her living space closer to the public, parts of her atelier with the authentic furniture and personal belongings were reconstructed in a separate part of the Museum gallery. The artist’s aspiration to reflect socio-political and historical events in her works is best seen in the portraits of many well-known scientists, artists and politicians. 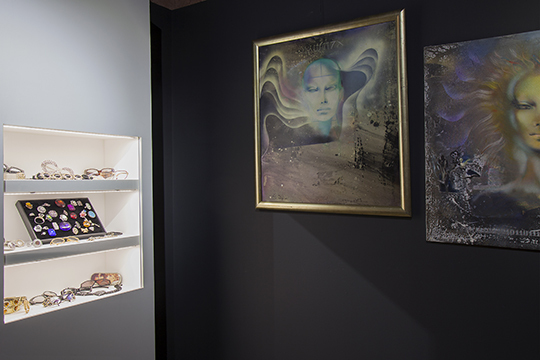 Among the works of art exhibited, the following are of particular importance: ‘The Cosmic Cycle’, ‘The Recycled Art History’, which includes portraits of famous artists who had influenced Olja’s work, and ‘The 20th Century’ triptych – a series of portraits of personalities who, according to the artist, marked the last century (Carl Sagan, scientist, Ivo Andrić, Miroslav Krleža and Marguerite Yourcenar, writers, Mick Jagger, musician, Neil Armstrong, astronaut, as well as the portraits of Vladimir Putin and Donald Trump, current presidents of the Russian Federation and of the USA respectively, painted in 1995). In addition, visitors can also enjoy parts of the collections that Olja Ivanjicki designed for the ‘Mona’ Fashion Company (the ‘Tesla’, ‘Njegoš’ and ‘Empire’ collections). Certain segments of Olja’s visionary artistic work are presented through an interactive application, designed by Borjan Pobrić. It allows visitors to learn more about certain works on display, and about the artist’s life and the ‘story behind the art’. Guided tours for individual visitors are on Fridays at 5 p.m. (by Suzana Spasić, Director of the ‘Olga Olja Ivanjicki’ Fund). For group visits, please call 3287-242 to book a term. The exhibition is open until November 2017.